Google’s excellent and altruistic Public Alerts system tells people in the United States, Japan and now Canada when should stay alert to stay safe. 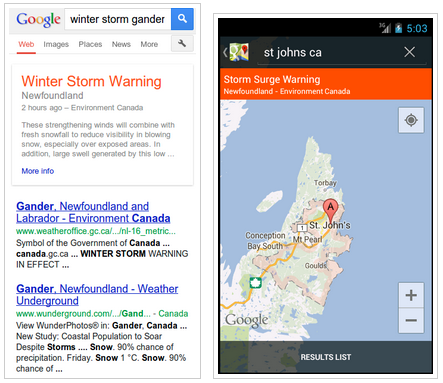 Plugging into Environment Canada’s severe weather tracking data, Google has begun to push out warnings to Google Now users on Android and Maps users on both Android and iOS. The information is also available through the web on the company’s Public Alerts page or when searching for relevant keywords on mobile or desktop. While the announcements will appear within specific regions automatically on an Android 4.1 or above device using Google Now, Maps users will only see the warnings when searching for a specific area. Public Alerts in Canada only extend to severe weather at the moment, but we’d expect future iterations to include AMBER Alerts in addition to other public safety announcements.